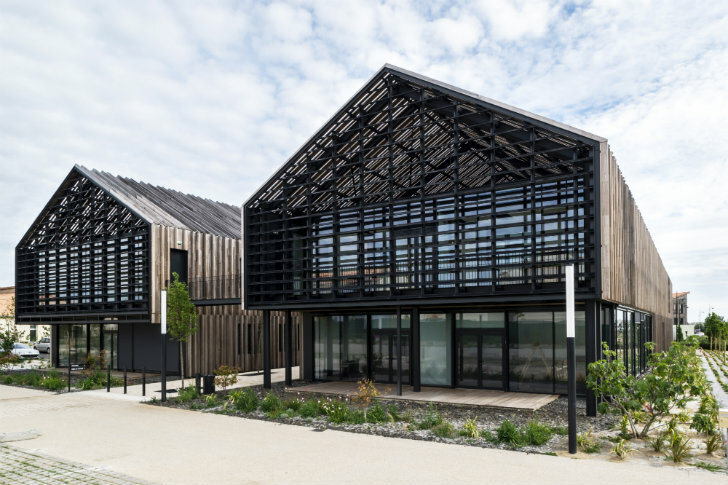 Atelier Arcau drew upon the traditional architecture of Pornic, France when designing this government building inspired by local salt warehouses. Salorge is composed of two long linear volumes clad in wood that shields the interior spaces from overheating. The wood and concrete buildings minimize energy use while appearing at once modern and traditional. The representatives of Pornic County wanted the Salorge government building to carry on the tradition of architecture in the Retz region (such as gabled, tiled roofs). The county government building is located in a business park and surrounded by hospital, police, and office buildings. With respect for the surrounding community, Atelier Arcau came up with a design that is both traditional and decidedly modern and forward thinking. Taking cues from salt warehouses common to the Atlantic coast, the project is composed of two long gable-roofed volumes clad in wood. 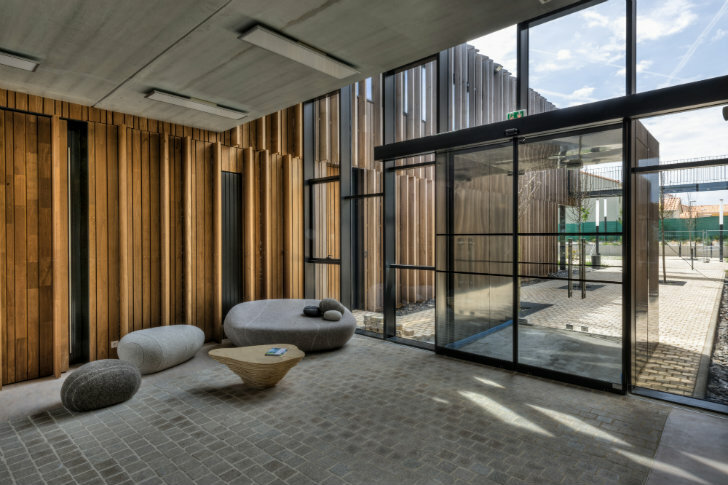 The buildings’ sophisticated wood skins allow daylighting while shielding the interiors from overheating with gaps and solid parts. A thick skin built with concrete and insulation further protects the interiors and helps minimize energy loss. The project was completed in 2012 and it achieved a BBC label as a low-energy consumption building. Salorge was also awarded first place in the 2012 World Architecture Festival in the Civic and Community category. The representatives of Pornic County wanted the Salorge</a government building to carry on the tradition of architecture in the Retz region (such as gabled, tiled roofs). The county government building is located in a business park and surrounded by hospital, police, and office buildings. With respect for the surrounding community, Atelier Arcau came up with a design that is both traditional and decidedly modern and forward thinking. Taking cues from salt warehouses common to the Atlantic coast, the project is composed of two long gable-roofed volumes clad in wood. The buildings' sophisticated wood skins allow daylighting while shielding the interiors from overheating with gaps and solid parts. A thick skin built with concrete and insulation further protects the interiors and helps minimize energy loss. The project was completed in 2012 and it achieved a BBC label as a low-energy consumption building. Salorge was also awarded first place in the 2012 World Architecture Festival in the Civic and Community category. Floor plan and side elevation.